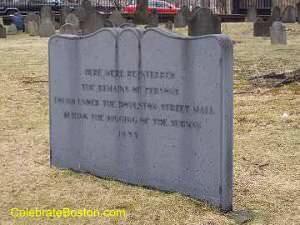 Within Boston Common at Tremont and Boylston Streets is the old Central Burying Ground. The town purchased the land for the cemetery in 1756. The earliest burials here were likely those of foreigners who died in Boston, and of poor people. During the American Revolution, the British had buried their dead from the Battle of Bunker Hill, and soldier's who died of disease during the subsequent winter occupation of Boston, in a trench on the northwest corner of the burying ground. Brick and stone tombs were built on the Boylston Street side beginning in 1793. Many burials were done here between 1795 and 1815. In 1836, the Boylston Street Mall was laid out (walkway lined with trees on both sides). Any obstructing graves that were unclaimed by ancestors were buried under this new walkway, and a line of tombs was built on the other side of the grounds for some of the displaced tombs. While constructing the subway under Boylston Street in 1894, the remains of about 910 people were unearthed. Several tombs that had been buried in 1836 were uncovered, which served as the receptacles for bones of other graves in the surrounding area. The remains were re-interred in 1895, and a slate tablet with three boundary stones, was placed to mark the spot. Monseur Jean Baptiste Julien, the noted Boston restauranteur who created Julien Soup, was buried here in 1805 (unsure if marker still exists). Gilbert Stuart, the famous portrait artist that painted George Washington, is also buried here (in tomb #61, a marker was placed along the fence on the Boston Common side). Samuel Sprague, a participant in the Boston Tea Party and soldier in the Revolution, and Charles Sprague, the famous nineteenth century poet, rests in Tomb #5.